In Great Smoky Mountains National Park, the Appalachian Trail charts a gritty, 71-mile course, gaining about 18,600 feet in the process. The trail runs nearly the entire width of the park, from Fontana Dam to Davenport Gap, clinging to the border between North Carolina and Tennessee. The stretch through the Smokies includes the loftiest section of the entire Appalachian Trail and the track through the park is remote, with the only option for an emergency bailout being Newfound Gap about 30 miles in. Backpackers expect to take about a week for the technical trek, but for elite runners, a new challenge has emerged: the Smoky Challenge Adventure Run (SCARt), which involves completing the entire Smoky Mountains National Park portion of the Appalachian Trail in one long-haul run. 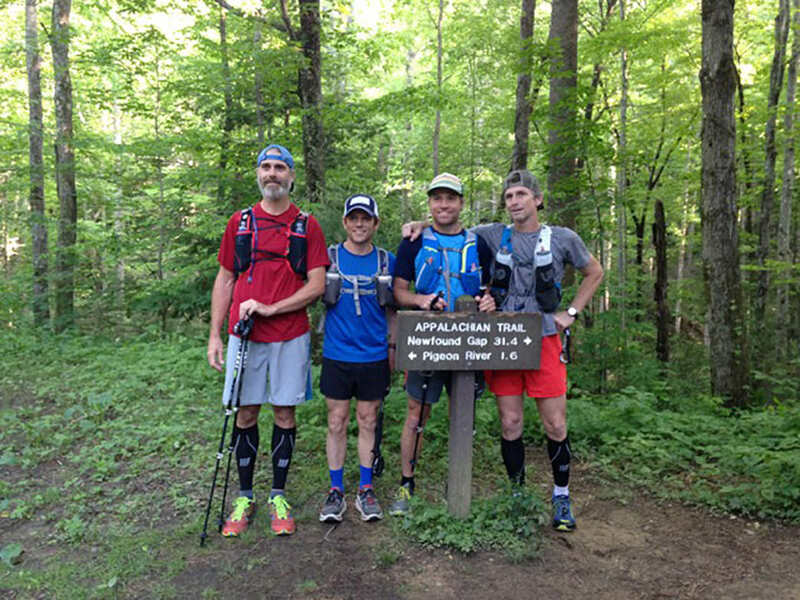 Last May—on Friday the 13th of all days—Chattanooga-based trail runner Chad Wykle and longtime friends Chad Fowler, John Dorough, and Steven Farmer took on the formidable Smoky Challenge Adventure Run. 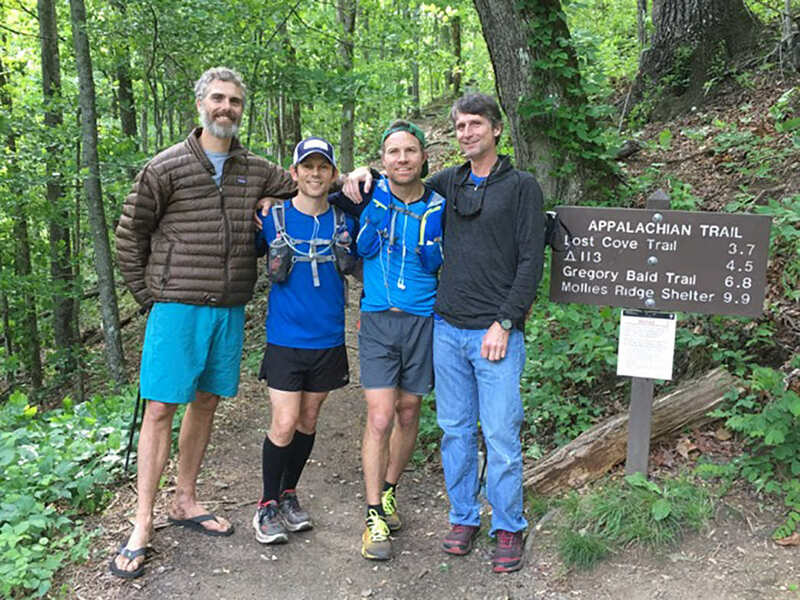 After transitioning from climbing to trail running, Wykle and his trail partners worked their way up to tackling the SCAR by doing area races in Chattanooga, including the Rock/Creek Trail Series, eventually progressing to longer-distance events. Before the SCAR, none of Wykle’s group had done the grueling stretch of the Appalachian Trail through the Smokies. “We may have hiked some of that part of the trail as kids, but we hadn’t done it as adults. It was all a new experience, and I wouldn’t have changed that. Just getting out with a handful of friends and getting into an adventure has a bigger draw for all us at this point in our lives,” Wykle says. The foursome embarked on the epic Appalachian Trail run around 6 pm, with just a couple hours of daylight left. The group ultimately took 22 hours to complete the 71-mile route. “The rain had just gone through and chilled things. Temperatures were falling. Around Newfound Gap, it was cold. You didn’t want to spend any time standing,” Wykle says. While running in mid-May meant cooler temperatures and rain, it also meant water was easily accessible along the trail—important because there is only one place to stop and resupply on the entire route. Aside from trailside water refills, the group was also supported by Wykle’s wife Rebecca and Farmer’s wife Kathy, who met the group about halfway through the route at Newfound Gap Road. “Seeing our wives at Newfound Gap, with the car all lit up with Goal Zero lanterns, was one of the high points of the run,” Wykle says. Despite meticulous preparation and tiptop fitness, any adventure can be derailed by unforeseen snafus or just pure bad luck. For Wykle and his friends, calamity stuck just prior to mile 30. Nutrition-triggered stomach issues began crippling Fowler about 20 miles into the SCAR, and just before the route’s only exit (Newfound Gap) the runners had to face the severity and reality of Fowler’s condition on the trail. In the middle of the night. “We had to have a heart-to-heart about being able to finish. It was heart-breaking to have to button him up. Knowing that the four of us wouldn’t finish together hurt pretty bad,” Wykle says. But shortly after the heartbreak came one of the highlights for the group. Just as the sun was coming up, the runners topped out at 6,644-foot Clingmans Dome, the loftiest location on the entire Appalachian Trail. After the demoralizing loss of Fowler, cresting the high point was “a big spirit lifter,” says Wykle. There were some gear surprises too. One of Wykle’s trail essentials was an unexpected last minute addition: Black Diamond ultralight trekking poles. “It was an item a lot of folks use on the run, but I wasn’t planning on it until the week before we left. But they were a great item. I could use them when the trail was steep and then tuck them behind me I didn’t need them,” Wykle says.